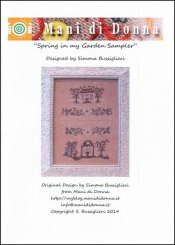 Spring In My Garden Sampler [C5997] - $13.00 : Yarn Tree, Your wholesale source for cross stitch supplies. Cross Stitch pattern from Mani di Donna. A country home with a white picket fence is stitched at the top of the design. In the middle, the alphabet is stitched. Below the alphabet is a spring garden. Stitch count is 90W x 150H.